Novo Nordisk is a Danish pharmaceutical company whose products are marketed in over 165 countries . The company has specialized in products for people living with diabetes for over 90 years. The current iteration of the company was born in 1989 from a merger between Denmark’s top two insulin producers, Nordisk Insulin Laboratorium (founded in 1923) and Novo Terapeutisk Laboratorium (founded in 1925). Since that merger, Novo Nordisk has expanded significantly, becoming a global leader in diabetes care, hemophilia care, growth hormone therapy and hormone replacement therapy. In terms of sales revenue, Novo Nordisk ranked 17th among global pharma companies in 2018 . The majority shareholder for the company is Novo Holdings, who holds 75% of its voting shares  and is also the holding company for Novozymes. 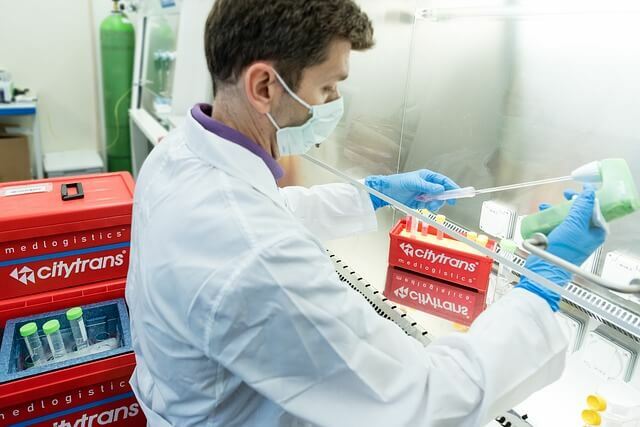 Novozymes was founded in 2000 as a spinout from pharmaceutical company Novo Nordisk, focused on discovering and producing industrial enzymes, microorganisms, and biopharmaceutical ingredients. In this article, we’ll delve into the current business operations and future objectives of Novo Nordisk. 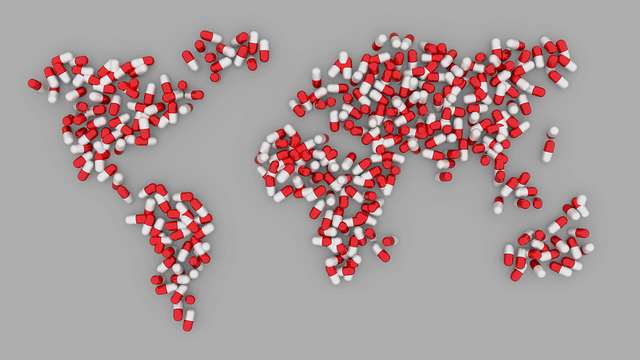 We’ll start out by giving a business overview for the Danish pharmaceutical company, then provide a summary of their outsourcing history, global drug development sites, and key decision makers internationally. 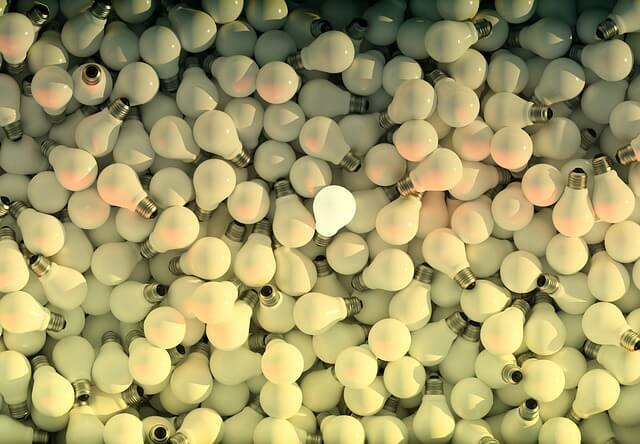 Finally, we’ll end off by covering some of the company’s current strategies for capturing innovation. At the end of 2017, Novo Nordisk employed 42,682 people in 79 countries . The majority of their sales revenue comes from diabetes care, which accounted for 81% of sales shares in 2018 (up 3% from 2016). Other strategic focus areas for the company include haemophilia (9% of sales), growth disorders (6% of sales) and obesity (2% of sales) . R&D costs for the company totalled about 14 billion Danish Kroner in 2017, representing 12.5% of sales for the year . This expenditure is 4% less than the 2016. In October 2016, the company announced their new R&D strategy, which would lower research costs and lead to the discontinuation of several ongoing research projects. This updated R&D plan also includes increasing the innovation level within the company’s core therapy areas and increasing R&D efforts into serious chronic diseases with high unmet needs and market attractiveness . Specifically, they intend to focus on cardiovascular disease (CV), non-alcoholic steatohepatitis (NASH) and chronic kidney disease (CKD), via their existing product semaglutide, which may have positive effects on these diseases . A table summarizing the pharmaceutical products currently being marketed by Novo Nordisk can be found below. In addition to their existing products, the company currently has 14 compounds in various phases of development  and 91 active clinical studies. Novo Nordisk has entered into several collaborations in recent years, with a varied array of partners. They have a history of outsourcing to specialized contract research organizations (CROs), distributors, and other partners. Novo Nordisk manufactures most of its products in house and tends to avoid partnerships with contract manufacturing organizations CMOs , although there have been a few exceptions to this policy in recent years (particularly in terms of expansion into new markets). Recent CRO collaborations have included their August 2018 partnership with Evotec for the development of small molecule therapies to treat diabetes and obesity patients  and their September 2018 partnership with Ossianix Inc for the development of therapeutic agents capable of crossing the blood brain barrier for diabetes and other metabolic diseases . In other recent news, in April 2018, Emisphere amended their existing 2015 Development and Licence Agreement with Novo Nordisk for the development and commercialization of oral formulations for four of their investigational molecules . A recent CMO collaboration was announced in February 2018, when the company entered into partnership with Eskayef Pharmaceuticals to launch a new manufacturing facility in Bangladesh, to reduce the country’s dependence on imported insulin . Prior to that, in December 2017, they partnered with Torrent Pharma to expand their Indian insulin manufacturing facility . In terms of recruitment-centric collaborations, Novo Nordisk partnered with a company called Trialbee in January 2014 for e-recruitment assistance. The company’s web-based platform allowed fast and effective recruitment for Novo Nordisk’s Phase II and III clinical trials for diabetes in Sweden, Norway and Denmark . Do you have a Zymewire account? Click here to view all of Novo's global activity! Since Novo Nordisk tends to avoid partnerships with CMOs and handles most of its product manufacturing in-house, they have a large number of production sites internationally. 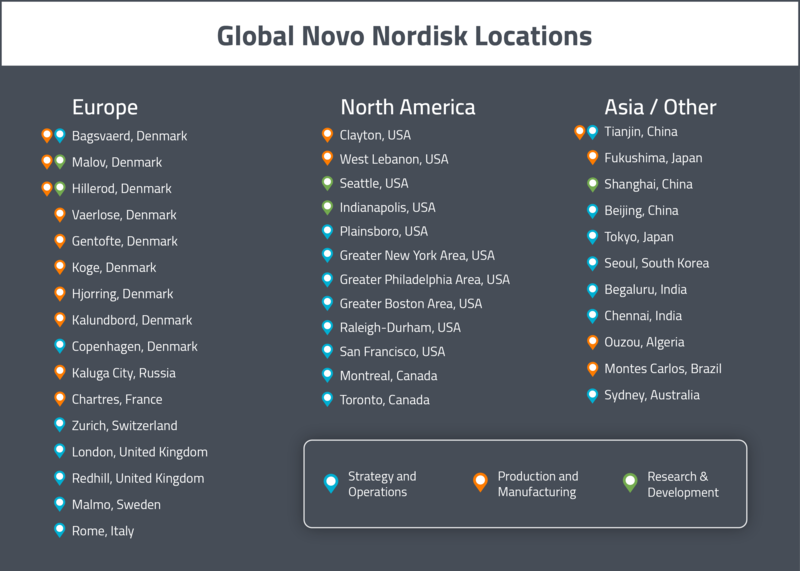 In this section, we will provide a map of Novo Nordisk’s major sites across the globe. For a visual representation of these global sites, see the map below. Unsurprisingly, given that the company was founded in Denmark, the company’s global headquarters are located in Bagsvaerd in Denmark. As we will see later, most of the company’s decision making comes out of this office. In Europe, the majority of the company’s production sites are located in Denmark. There are R&D and production facilities in Malov and Hillerod. 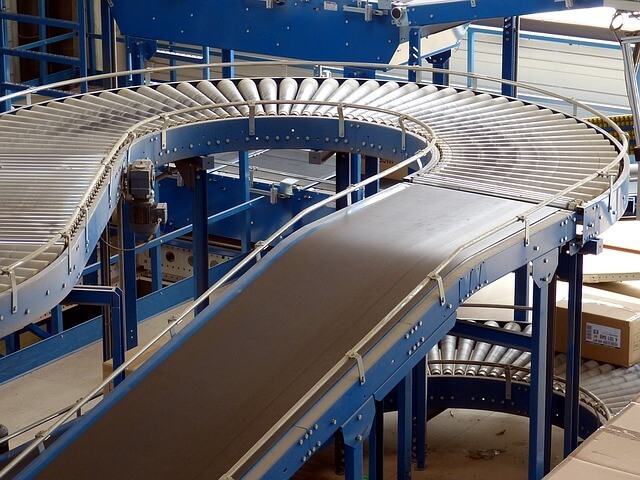 Other sites specifically for production are located in Vaerlose, Gentofte, Koge, Hjorring, Bagsvaerd and Kalundbord. Outside of its sites in Denmark, the company also has production sites in Chartres (France) and Kaluga City (Russia). They are also planning to open a research center in Oxford (UK) sometime in 2018. 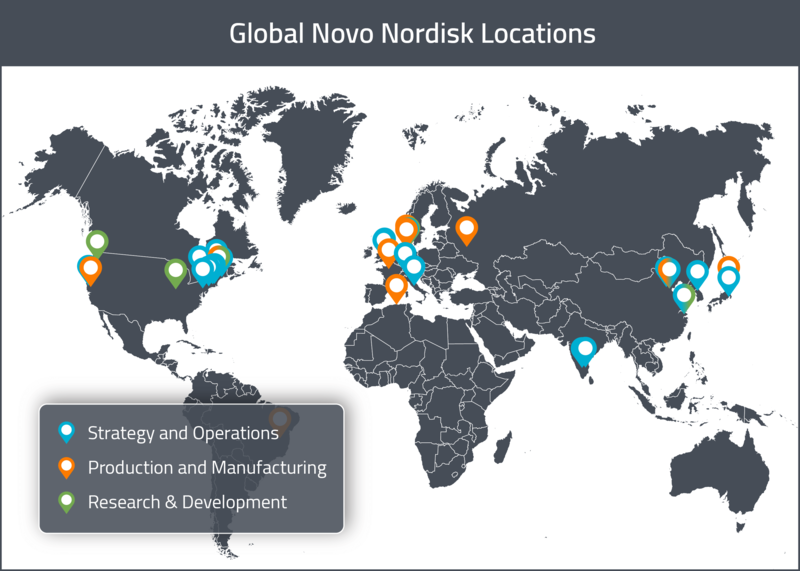 In North America, Novo Nordisk has a few production and research sites in the United States. There is a production and manufacturing site in Clayton (NC) and a manufacturing and development site for hemophilia products in West Lebanon (NH). There are two R&D site for diabetes and obesity in the United States, located in Seattle (WA) and Indianapolis (IN), respectively. There is also a clinical trial management, sales and marketing site in Plainsboro (NJ). Novo Nordisk also has additional production and research sites in other parts of the world. Specifically, they have production sites in Algeria (Ouzou), Brazil (Montes Carlos), China (Tianjin) and Japan (Fukushima). They have a research site in China (Shanghai) as well. Decision making has been classified into three sections: clinical outsourcing, manufacturing and logistics. This is to facilitate outreach efforts by different types of companies looking to sell to or partner with Novo Nordisk. The general trend encompassing all types of decision making at Novo Nordisk is that most decision makers are based out of the Copenhagen area in Denmark. Manufacturing decisions are almost exclusively based out of Denmark. European logistics decision making is also almost exclusively out of Denmark, with some influence from Switzerland as well. This makes sense given Novo Nordisk’s Danish roots and heritage. Where are they making clinical outsourcing decisions? European clinical decision making is spread out across Switzerland, Denmark, UK, Italy and Sweden. There is a Director of Clinical Operations and Clinical Trials Managers in Zurich, Switzerland. In Copenhagen area (Denmark), London (UK), Rome (Italy) and Malmo (Sweden), there are Clinical Directors and Clinical Project Managers. There are also Outsourcing Managers in Copenhagen (Denmark) and Clinical Project Managers in Redhill (UK). In North America, clinical decision making is split between Canada and the United States. In the Greater New York Area (New York, USA) look for titles such as: Manager of Vendor Management & Clinical Outsourcing, Associate Director of Clinical Trial Management and Clinical Trial Manager. In the Greater Philadelphia Area (Pennsylvania, USA), there is a Clinical Project Manager and a Director of Clinical Development. In Canada, there are Clinical Trial Managers located in Montreal (Quebec, Canada) and Toronto (Ontario, Canada). For the Asian Pacific Area, there are decision makers spread across Korea, China, India and Japan. In Seoul (Korea), there is a Clinical Director. In Beijing (China), there is an Associate Director of Clinical Research and a Clinical Trial Manager. There are also additional Clinical Trial Managers in India (Bengaluru area and Chennai area) and Japan (Tokyo). Where are they making manufacturing decisions? Internationally, manufacturing decisions appear to come out of Europe—in the Copenhagen area of Denmark, specifically. In this area, you’ll find the Global Contract Manufacturing Manager, a Director of Contract Manufacturing and a Senior Manager of Manufacturing Strategy. The other location internationally that appear to house manufacturing decision makers is the Greater Boston Area, where there’s a Senior Manager of Manufacturing. Where are their global logistics operations based? In Europe, the majority of logistics operations decisions are based out of the Copenhagen area. In this area, you’ll find a variety of logistics job titles, such as Logistics Coordinator, Logistics Director, Senior Category Manager of Strategic Sourcing, Senior Manager of Supply Chain, Senior Category Manager of Logistics & Distribution and a Director of Procurement. Other than Denmark, the only other logistics decision making location in Europe appears to be Switzerland (Zurich), where they have a Director of International Procurement. North America also houses several logistics decision makers. In Raleigh-Durham (North Carolina, USA), look out for titles like Senior Manager of Supply Chain, Supply Chain Planner and Procurement Manager. In the Greater New York City Area (New York, USA), you’ll find the Senior Manager of Supply Chain, the Vice President of Supply Chain, the Senior Director of Procurement and the Senior Category Manager. In San Francisco (California, USA) and Toronto (Ontario, Canada), you’ll find Supply Chain Managers, with the latter also housing Procurement Managers. Following in the footsteps of all the other major pharmaceutical companies, Novo Nordisk has begun investing in start up companies and fostering a presence in innovation districts such as Boston, San Francisco and Europe. Novo Holdings, the holding company for Novo Nordisk and Novozymes, has recently launched a $165M venture fund focussed on tackling the problem of antibiotic resistant bacteria, of which $20-40M will be invested in start-ups and early stage companies in North America and Europe . The organization has also launched Novo Ventures, which is a $350M fund for investing in private and public life sciences companies in North America and Europe, particularly in biotech hubs. The company has teams in Boston, Copenhagen, London and San Francisco managing collaborations with over 140 companies since the inception of Novo Ventures in 2000 . Another approach to fostering innovation in Europe can be seen in Novo Nordisk’s recent commitment of DKK 82 million to the University of Copenhagen and Aarhus University for establishing the Novo Nordisk Foundation Fellowship Programme. This continuing education programme is meant to be an incubator for a national interdisciplinary team of future leaders and entrepreneurs in healthcare . Where can I find more information like this? If you would like a simple solution for helping your sales team become more proactive as well as keeping an eye on pharmaceutical companies without relying on a database and generic lists of leads each week, we at Zymewire are here to help. Request a demo today, and stay tuned for the next instalment of Sponsor Atlas: Selling to the Pharma Giants. If you enjoy these articles, please feel free to give them a share through the social links below! To view Part 4 of the Sponsor Atlas series, From A to Z: A map for Selling to AstraZeneca, click here! Ready to catalyze your sales? Get started with a demo of Zymewire today!